Do you know how to quickly and effectively market your real estate deals to get them sold faster and for more money? Do you know how to effectively syndicate your deals to social media and blast them out to your buyers’ list? Watch this short video on marketing real estate deals to learn how to sell wholesale deals! 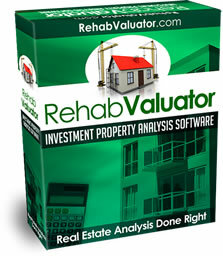 WHEN YOU UPGRADE TO REHAB VALUATOR PREMIUM, YOU GET OVER $1000 IN BONUSES! CLICK BUTTON ABOVE TO GET DETAILS AND PROCEED. YOU ALSO GET A 30-DAY MONEY-BACK GUARANTEE, NO QUESTIONS ASKED! Of if you’re risk-averse, TRY REHAB VALUATOR PREMIUM FOR JUST $1 !! This is great I’m upgrading soon! Thanks! We try and minimize the fluff and really provide people with information and tools that can help them move forward with their goals. If you ever have questions please let us know. My challenge is getting private money. I rehabed and rented out a duplex in Syracuse, NY using my own money. However, I have been trying for a year to find a private investor to take a mortgage on my property, so I can cash out, but so far I have been unsuccessful. I will be coming on board. Very interesting video. Very Good. Great tool, easy to use. Thank you. I’m interesting in wholesale , to star with.and them raise capital to do my own later.I own a limousine business and lots of my customer are from South American ,Venezuela,Colombia and so on. So I’m sure that if I present a good business plant to them they will be buying from as.they like the idea of buying properties in Miami or Fortlauderdale .Family houses.3/2. I also would like to know if my supcription for your premium course is active if not let me know. Hope doing business with you in a near future.Thanks. What is stopping this person from making the deal themselves after you give them the address, thus not giving you the $ 10,000.00 fee? Obviously one would have to have an contract on it, right. So how does one go about this if one does not have the Ten Grand in his pocket. You’re right! You need to have the deal under contract OR you need to not provide the entire address. Many wholesalers also use a non-circumvent agreement so people you offer the deal to can’t go around you. In regards to getting the property under contract you simply make and offer and sign a purchase contract with the seller. We even have sample ones in the bonuses are for premium members. Hi Levata. Actually you haven’t signed up for Premium. Also, I’ve responded to a number of your emails personally, with no response back from you and you seem to keep emailing us about the same issues. So I’m not going to do that anymore…. This is awesome!!!! I’ll be joining you soon. How much money For me to get started email me the cost or how much money I need to send. Great info Daniil thank you so much. You are welcome! If you have any questions don’t hesitate to contact us. Thank you for this it really helps to have something I can go back to when I need to. You’re welcome! We’re glad you’re getting good use out of it. Great job this video was awsome very informative . Do you have to have an account and followings to post on those social media sites? The answer is yes. To post to Facebook you do have to have a Facebook account. However, what I tell everyone, is that you can have a personal page with no friends and with almost nothing filled out. Then create a business page in which you list properties, get followers, etc. That is of course if you’re simply not comfortable doing the social media thing. I think it is’s great we are at the beginning stage, my daughter and I was interested in fix and flip, now we will be doing wholesaling. The marketing portion of the video I really enjoyed .Im sure I will be upgrading to premium soon . As always Danil your content is spot on and your program Rehab Valuator is a one stop shop for investors like myself. Thank you for this program. The quality of the presentations are key to everything we do as an investor. Thanks again for making it easier to raise capital from PML. Thanks Michele! Glad you are enjoying everything. We are happy to have you. Please reach out if you need anything. I have already received this video. Do you have anything new? What specific information were you looking for? I am happy to send some great content your way! I am virtually a Newbie. Discovering your software has been exciting; has me chomping at the bit to get started. Thank you, I am so excited. We are excited to have you. Please reach out if you have any questions!